No jazz musician needs to be told how tight money is in this recession. Budgets are being slashed everywhere, and perhaps most in education.Now imagine that you have a class of eager guitar students but no guitars and no money to buy them. What would you do? Welcome to the world of Bruce Edmiston. 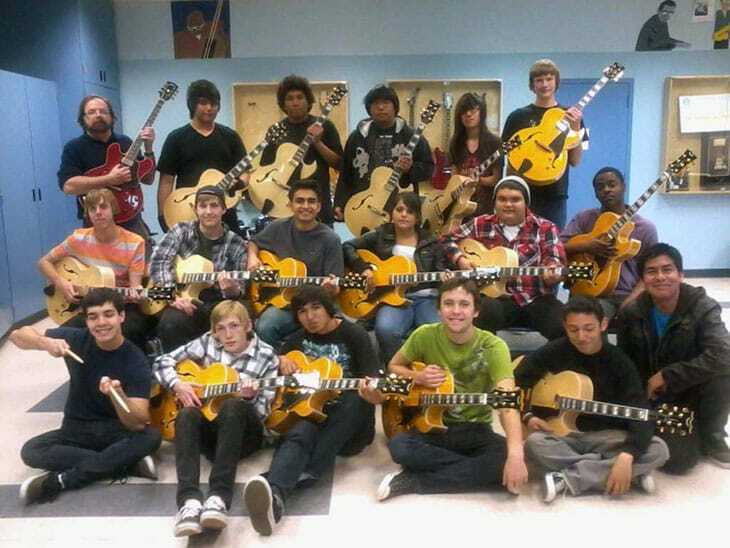 Bruce has been teaching his guitar class at Oxnard High School for thirteen years, focused mainly on jazz guitar. He tells us: “I inform everyone from day one that I teach music and that we will be using the guitar as the instrument to bring that music to life.” JJG readers will be familiar with the materials that Bruce uses in the classroom: “Robert Conti offers materials that are just fantastic. From chord melody, to improv, to technique, he provides it all. Most importantly it is affordable which is important because of dwindling school budgets for music. Howard Morgen is a treasure trove of material as well. I believe that I have every book both of those men have published which might explain why I haven’t bought a new guitar.” Bruce also uses his own teaching materials, an extensive collection that he has built up from his years of playing with different acts. Lots of material, but no guitars. It turns out that Bruce had made the right call. Considering the request, Robert decided that two guitars would not be enough for a group of sixteen eager young guitarists, so he got on the phone to Jon Puhl at Dean Guitars to see if there was something they could do for Bruce’s kids. As a favor to Robert, Jon did. Dean Guitars decided to offer Bruce 16 archtop jazz guitarsat a tiny fraction of their true price – enough guitars to outfit the entire class! Back in Oxnard, Bruce was floored to receive the call from Robert Conti telling him of the generous offer from Dean Guitars. Having planned on holding a competition between the students to use one of the two new guitars, here was an offer of one for each student – but he still had no money to buy them. “I didn’t have enough money at that moment but went calling in every favor I’ve ever done for our administration and district personnel until I got the money and we purchased our guitars.” Are the kids happy? Take a look at their picture! Bruce Edmiston is unreserved in his appreciation of Robert Conti’s magnanimous gesture. “If not for Robert Conti we would not have these beautiful guitars to play. Mr. Conti has helped create an excitement in my students that is unmatched. Thank you Robert! You walk the walk. Look at the photo and the sheer delight on the face of the students. This is why I do this job and I am grateful to JJG and Mr.Conti.” Ever the gentleman, when I contacted Robert Conti about this story he pointed to Jon Puhl and Dean Guitars as the ones who saved the day, but I think we can all agree that this was a group effort. In these tough economic times, it is inspiring to see jazz guitarists pull together to help the next generation on the path to music. Robert Conti, Jon Puhl, and Dean Guitars – you are an inspiration to us all!